Want a fun and creative way to display your child’s school photos? 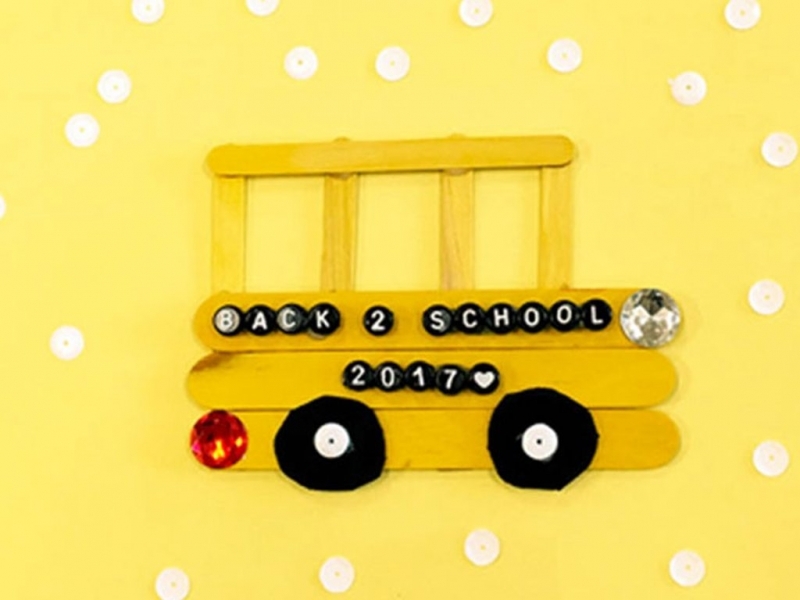 Try this creative school bus as a way to note what year it is and have all of your photos for that year in one place. Paint 3 Jumbo Sticks and 5 Skinny Sticks yellow and let dry. Cut an inch or so off of the end of 4 of the skinny sticks and arrange them so they are spaced about 1 inch apart vertically and glue the fifth skinny stick across the top. Glue the 3 Jumbo sticks across the bottom of skinny sticks, parallel with the uncut one. Cut two circles out of the black craft foam and glue them to the bottom of your bus. Embellish the wheels, add “headlights” or “taillights” to your bus using your items and if you would like use the sticky letters to spell your child’s name or the year number. Attach photos to the “windows” and then magnets if you plan to display.